For the past few days I have been oiling my beard Baller Beards ‘Patch Adams’ Beard Oil, a brand who are based in Wicklow, Ireland. I had previously used their ‘Woodrow’ oil and I was impressed by that and so I was looking forward to trying this one. Its a mix of Sandalwood, Patchouli and Grapefruit essential oils on a blend of Coconut and Sesame seed oils and its a very nice oil. Its so expertly blended by James and Claire that no one oil overpowers the others and you get an amazing sweet, fresh, warm beard oil that leaves your beard not only feeling amazing but also looking good. Patchouli is often used in skin care to help acne type conditions, eczema, inflammation and dry cracked skin, Patchouli is also anti-fungal and it useful to help dandruff and so should help with the beardruff! Sandalwood oil is antiseptic and anti-inflammatory and Grapefruit oil is a great antiseptic and gives that fresh smell. So this is a great mix of essential oils that not only smell amazing but are perfect to maintain a healthy beard. So this oil should really help if you suffer from the dreaded beardruff or skin problems under the beard. 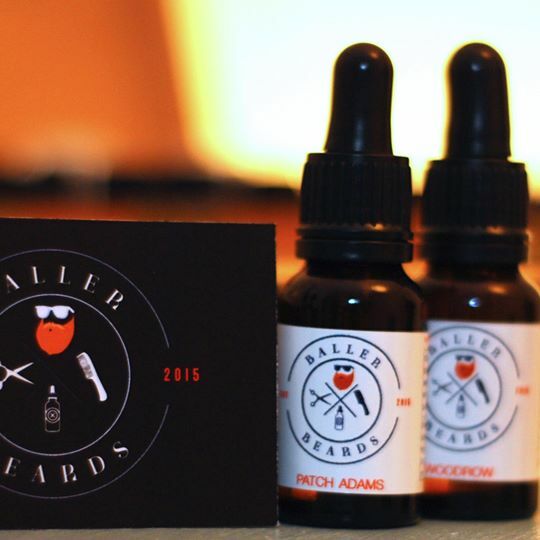 You can purchase ‘Patch Adams’ from the baller Beards Facebook page and it comes in 15ml for 16 euros or 30 euros for 30ml and comes in a glass bottle with a glass dropper to dispense the oil. You can also find the oils in the following Barber shops in Ireland, Robin’s Nest in Kilcoole, Go gym in Charlesland, Sports Cuts in Greystones and Beards and Barnet’s in Dublin city centre.